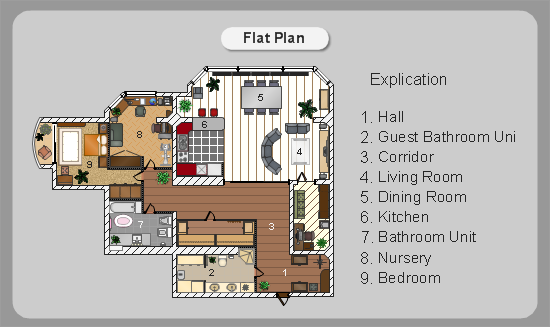 ConceptDraw has numerous examples and templates for drawing Home Plan. You can create custom great-looking designs of small house plan too fast with the library of more than 10000 vector cliparts. You can use the Bath and Kitchen Plan stencil that contains shapes for fixed elements such as bathtubs and sinks. You'll find all of the simple house plan templates and example plans of one floor houses. Also you can create your own designed house floor building plans using stencils of walls, windows, doors, furnitures and other elements. This small custom house floor plan sample is drawn using ConceptDraw DIAGRAM diagramming and vector drawing software enhanced with Building Plans Solution. 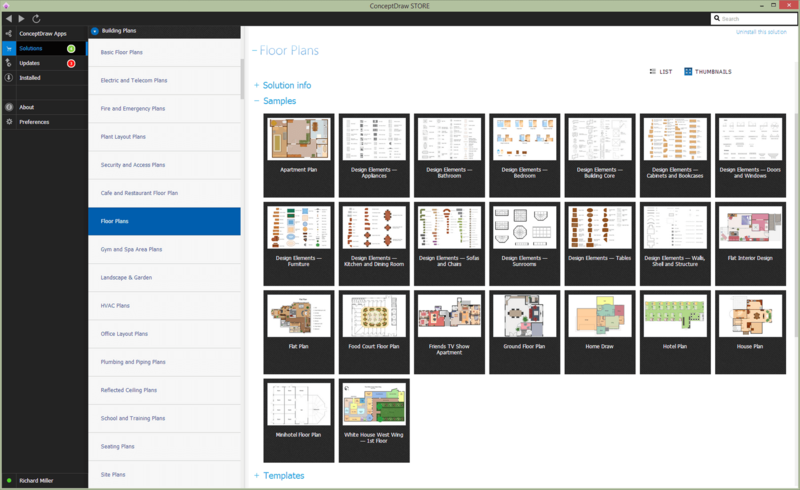 The Building Plans Solution from ConceptDraw Solution Park provide samples, templates and shapes libraries for drawing the building plans, floor and site plans, blueprints, landscapes and garden layouts and designs. Nowadays, more and more attention is paid to the comfort in the workplace, so that employees might be more motivated. Thus, it can be said with full confidence that office layout plays an important role for employees and influences company reputation. Many worldwide known companies have headquarter offices resembling more of a campus than of an office building. Every organization has its own unique office design ideas, needs and requirements. Each of office position requires a certain type of person who has his own requirements, needs and habits. Office layout should be designed to facilitate its business function. The well-organized office space plays an important role in a workflow enhancement and productivity improvement. This office layout diagram demonstrates a typical cubical office layout. This diagram can be use as a template for cubicle office layout organization. This visual example can help shape ideas and design your office layout conception. You can start with adding your requested office furniture objects into your office floor plan. Plants help to create a healthy indoor environment. You can design an office space that totally fits your needs. Try ConceptDraw program, the perfect drawing tool for creating all kinds of great-looking drawings, charts, graphs, and illustrations. House Plan Software — Create house blueprints or a construction drawing. This example is created using ConceptDraw DIAGRAM v12 diagramming software enhanced with solution Building Plans from ConceptDraw Solution Park.